I never expected needing to carry a baseball bat for walking my own property. I swing bats to miss pitches. Not fend off intruders. We own an investment property in town, an old walnut orchard thick on bark, long on limbs and short on shade. The trees are geezers and recent drought years have stressed them beyond good health—a true orchardist would have felled them. But we’ve hung onto the lot, trimming what we can within our gerbil powered real estate budget. Gravity directs dropped branches onto our side of the fence. The lot also has a small house, a rental. It’s temporarily vacant until we complete interior repairs. I mow and weed-whack on a weekly basis during spring then let up to twice per month during the summer heat. It’s a mixed blessing owning this property. We’re fortunate to afford it but that said I should really spend more time finishing projects in our own yard. Sweat beaded down my forehead as I trudged between patches of shade. Perspiration soaked through my leather boots. Pieces of grassy shrapnel covered my t-shirt and eyewear. My weed-eater whirred, chopping weeds like a Cuisinart. My brain cruised in control as I whacked and cut. Then I stumbled upon a fiberglass exoskeleton. 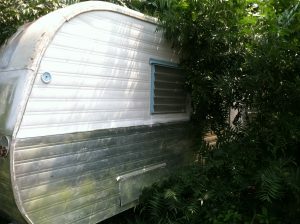 It was 1960’s era sixteen foot Kencraft single-axle trailer. What? I hadn’t been to the property in over a week. Some idiot abandoned it on our lot. I shut off the weed-eater and peered inside. Empty. Fortunately a gun barrel didn’t point at me. Startled, I went home and called the police. It was a Sunday. I heeded his advice and filed a claim. I also filed a Trespass Arrest Authorization Form with the police department. The next Saturday night I received a call from a neighbor, Sue, a retired realtor. “People are moving into your lot,” she wailed. “I’m terrified.” I was traveling and about an hour from town. This was getting spooky. 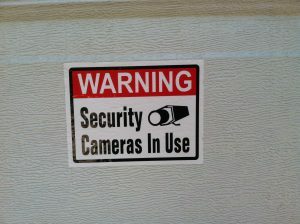 The next day I shopped for signage: No Trespassing, Neighborhood Watch and Keep Out. I bought and installed solar charged lamps that turn on at night. I patrolled the lot several more days and met with another neighbor, Frank. I made sure Frank had my phone number. It’s a sad state to encounter, having someone trespass, damage, or abandon their unwanted items on your property. I like to think I’m empathetic towards others who are not as fortunate as me. But now I’m less tolerant, less trusting, and more suspicious. Unfortunately a few bad apples spoil the bunch. 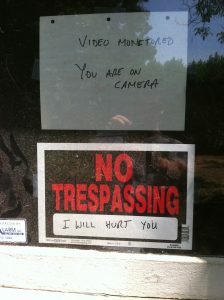 More so than being trespassed, is a feeling of personal violation. It’s not fair. And there’s not much I can do about it except lock our possessions, get to know our neighbors, and hope for the best. If you are a victim of unlawful dumping or trespassing notify authorities. For my circumstance I greatly appreciate the rapid, professional response of the City of Chico Police Department and the City of Chico Code Enforcement Office. Good work folks. Readers: If you reside within the Chico city limits and are a victim of illegal dumping contact the City of Chico Code Enforcement Office. 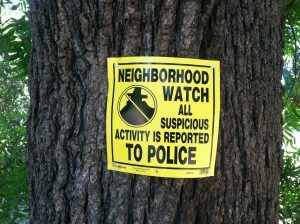 For specialized neighborhood policing contact the City of Chico TARGET Team. For residents of unincorporated Butte County contact the Butte County Sheriff’s Office. 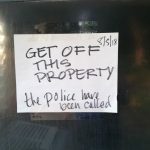 This entry was posted in Community and tagged burning man, code enforcement, community policing, home security, illegal dumping, neighborood watch, trespassing. Bookmark the permalink.